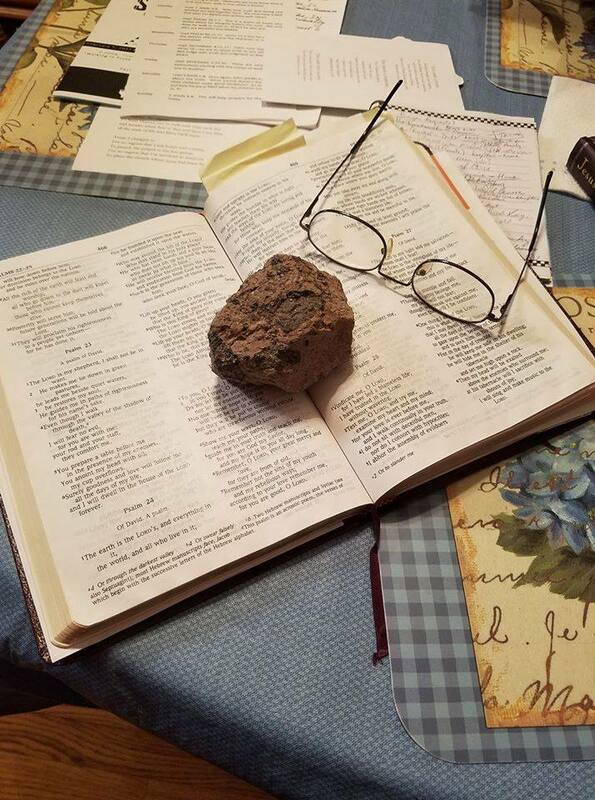 So, this morning, as I was doing my devotions, I noticed a “rock” still sitting in my backpack. I thought I had emptied out all the rocks at the foot of the cross. But here was this ONE. Fairly good sized, too. What is this, I thought? So, I began to do my devotions and every single verse pointed to this rock: FEAR. Fear of the unknown, fear of future circumstances, fear of being alone, fear of making wrong decisions, and on and on. As I read my devotions, I was taken again and again to the book of Isaiah. Hmmmm….. He says God will strengthen and help me…..
Beloved, God is ALWAYS with us. He WILL never leave us. He WILL go through every FEAR with us. He only asks us to TRUST Him. Are there any rocks still sitting in YOUR backpack? This is my kitchen table where I do my devotions. I have that rock to remind me of giving my "rocks" to Jesus. I'm being encouraged to put a book together with all of my writings. For now, I just keep writing. I like the feedback I get when people read what I wrote. With the Parkinson's Disease, who knows how long I'll be able to write. But God has given me this gift and I want to use it for His Glory.